is a Chicago-based independent publisher dedicated to publishing only the finest mysteries, timeless classics, and select nonfiction. When it first came out in 2002, The Trials of Lenny Bruce not only established itself as the definitive work on Lenny Bruce's free speech trials, it led to the late comedian's posthumous pardon for his conviction on obscenity charges in New York by then-governor George Pataki. 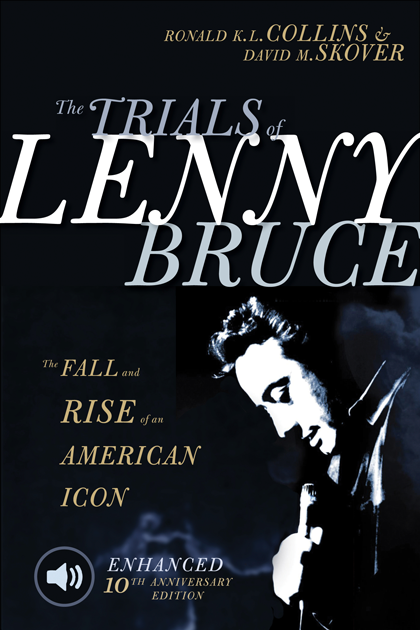 Originally packaged in hardcover with an audio CD, this 10th Anniversary enhanced eBook edition includes embedded audio from Lenny Bruce's most controversial performances, as well as exclusive author interviews with the colleagues, friends, and lawyers who defended him—including George Carlin, Hugh Hefner, Lawrence Ferlinghetti, and Albert Bendich. Also included in the enhanced eBook edition are archival audio clips secretly recorded during Lenny's New York obscenity trial. The Trials of Lenny Bruce is an important document of the free speech battles of an icon of American comedy who, by speaking his mind and fighting the good fight, paved the way for every standup comedian, satirist, and social critic who followed him. Ron Collins and David Skover are friends. Ron lives in the East, David in the West. They have been writing together for almost three decades. Their work is a joint effort, with David manning the keys and Ron pacing. They have coauthored four books together, The Death of Discourse (1996, 2005), The Trials of Lenny Bruce (2002, 2012), Mania (2013), and On Dissent (2013). Ron, who grew up in Southern California and graduated from the Loyola Law School in Los Angeles, is the Harold S. Shefelman Scholar at the University of Washington Law School. David, who grew up in Wisconsin and earned his law degree from Yale, is the Frederic C. Tausend Professor of Constitutional Law at Seattle University. Both have written numerous scholarly articles (often together) in journals such as the Harvard Law Review, Stanford Law Review, and in the Supreme Court Review. © Top Five Books, LLC. All rights reserved.